Things That Are Awesome, Chapter Two. 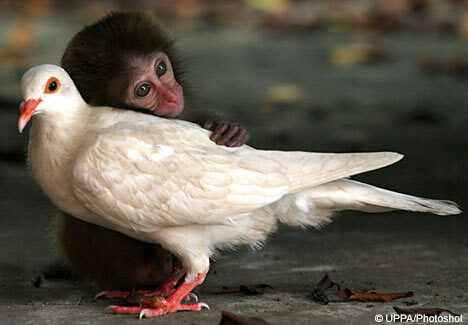 You’ve probably already seen this picture of a monkey and a pigeon. You won’t mind looking at it again, will you? We went to see Joe Henry at Largo the other night, and it was utterly transcendent. I wanted to find a video that would convey the amazingness of this exact evening, this brilliant songwriter backed by a flawless band playing his new songs, some of which were so stunning you (read: I) couldn’t breathe for a minute. I didn’t find that. I did find this on YouTube, though: Henry with Billy Bragg, performing Bob Dylan and Van Morrison, and that is not too shabby either. You should really go buy Civilians right now . As I am writing this, I have the same strange mixture of anger, shame and hope that I always have when I write about the places where my desire to be a good citizen of the planet collides with my desire to be accepted as one among many fallen humans, normal people who just want to live a good life, who want to enjoy the occasional chicken McNugget and not have that moment ruined for them by a Climate Change Cassandra campaigning against junk food. I’m not sure I’ve ever heard anyone sum up so neatly what it is that often keeps me from fully taking sides on issues I actually feel rather strongly about. So I thought I’d pass it along just in case it gives anyone else a lightning-bolt moment.